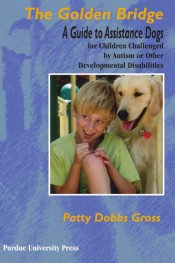 The Golden Bridge: A Guide to Assistance Dogs for Children Challenged By Autism or Other Developmental Disabilities (New Discoveries in the Human-Animal … (New Discoveries in the Human-Animal Bond) by Patty Dobbs Gross. This book tells how specially bred and trained dogs help to facilitate communication for children with autism and other developmental disabilities. It provides advice about living with autism, animal-assisted therapy, training an assistance dog, and using an assistance dog to deal with a child’s grief. Pp. 180. This entry was posted in Interventions, Our Library and tagged Autism Spectrum Disorder, books, Communication. Bookmark the permalink.